ADAMAVI, the pleasure of lasting value. 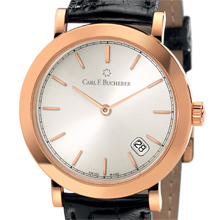 Watchmaking skills, technical innovations and continuity are values that define Carl F. Bucherer. With the Adamavi range, the Swiss watch brand has succeeded in creating a collection that stands for the pleasure provided by timeless design and for a unique philosophy: the striving to preserve things of proven value. Since it was founded over 120 years ago, the Bucherer enterprise has remained in the sole possession of the family of the founder, Carl Friedrich Bucherer. 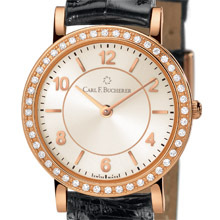 As a result of this continuity the Carl F. Bucherer watch brand, which has been independent since 2001, has become a quality brand whose success is based on a valuable store of experience in the field of mechanical watchmaking and the art of jewelry. Although Carl F. Bucherer stands for a constant drive for innovation and a high degree of technical development, it is of great importance to the brand that proven technologies and design elements should be carried over into the future. The preservation of proven value. The principle of holding on to the proven values of the past is embodied in the classic appearance of the watches in the Adamavi family. The very name Adamavi stands for a feeling that these watches trigger in the wearer: translated from the Latin, Adamavi literally means “to come to love something” or “to take pleasure in something”. Because all the models in the range are characterized by timeless simplicity and mechanical reliability, they are more than just timepieces. They are true companions whose visual appeal will outlast the short-lived trends of our present time, conferring an aura of reliability and continuity upon their owners. With their understated and enduring design, watches bearing the name of Adamavi can be worn on any occasion. These puristic timepieces have their own aesthetic continuity, and therefore represent real value that is certain and timeless. Value that will also provide lasting pleasure for the wearer. One striking model in the Adamavi family is the Adamavi Pavé, perfectly executed in 18 K rose gold. 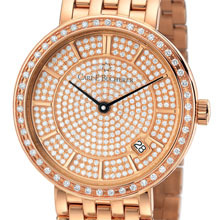 The dial and bezel are set with sparkling diamonds, arranged in circles from the center outwards. In combination with the gold-colored baton markers, they suggest a shimmering sun whose radiant power lasts forever. As will your pleasure in a watch from the Adamavi range. A watch you will certainly never want to give away.